Is this pic in DC? Very pretty! I love how the water reflects the building; the expanse of lawn; the flowers, the sky, the clouds, the trees, the pathway. The building looks fascinating! It looks like lily pods in the pond, I just noticed now…it shimmers in such a beautiful way! The water & everything else look so clean! The building looks like a museum, a library or it’s purpose has something to do with the government. Maybe it’s a courthouse. Looks like this is out in the countryside somewhere. Looks so orderly, no litter around; really meticulous! Every aspect of this photo fascinating, because I notice something else I didn’t notice previously! The building looks very old. I like the pathway it looks like angel wings. Everything will be Okay! L’ha ribloggato su Pensiero felice. its looking really nice…reflection in water makes it more beautiful..!! I love you so much for saying that Matt. The pathway doesn’t go perfectly straight, I noticed, which is very interesting. There is so much clarity in this photo that I don’t know where to focus my eye on. Still, it’s beautiful. very inspiring, makes me want to write a few lines. Thanks Matt for the reminder…”Everything is going to be alright! !” such a beautiful pic of serenity and strength. Wow, a wonderful place and motivational saying! 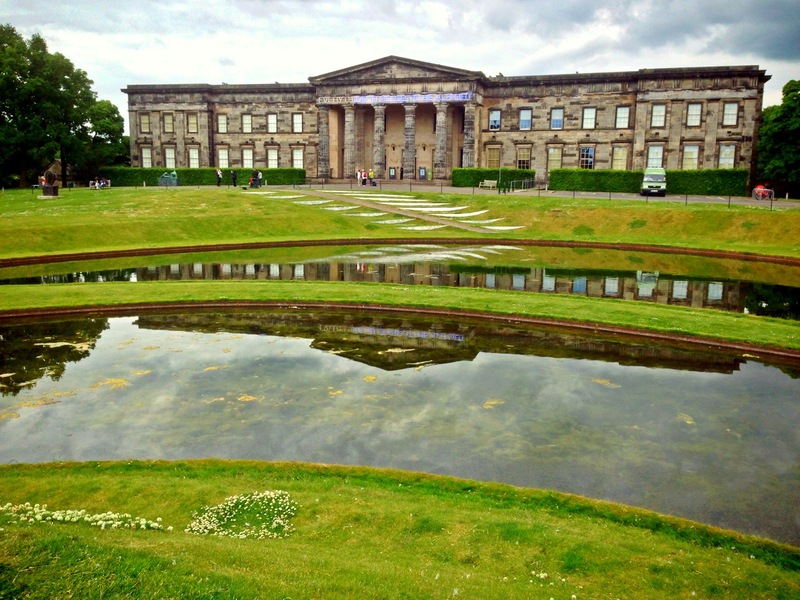 This is the Scottish National Gallery of Modern Art building. Opposite this building is the Dean Gallery another magnificent building. I know this because I walk past this building everyday to get back home. So glad I live in a city like Edinburgh some architectures are beautiful. It must be quite a challenge to navigate this building-really huge! Makes it both gorgeous & fascinating at the same time, that part of the museum is reflected in the pond! Lots of nature! Nice shot. Shows how effective reflections can be.